Are you suffering from gums that bleed easily, tooth sensitivity, or bad breath? You could be one of the millions of Americans affected by gum disease. Many Americans aren’t even aware of the problem lurking beneath their gums. Often times, the first symptoms of gum disease are subtle, beginning with bleeding, red, or swollen gums. This is caused by an infection happening below the gum tissue. If left untreated, those suffering with gum disease can suffer from chronic bad breath, receding gums, and excessive (or often worsening) pain while chewing. In extreme cases, untreated gum disease can even result in tooth loss. If you’re passionate about maintaining you dental health, or even getting it back on track: it’s time to meet with Dr. Scharf! Gum Disease is caused by the accumulation and buildup of plaque and tartar along the gum line. Built up plaque harbors dangerous bacteria and causes your gums to pull away from you teeth. 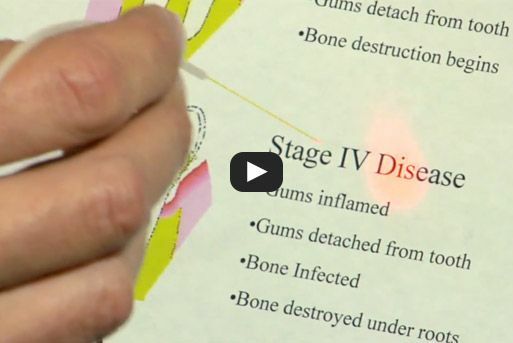 When the infected gum tissue pulls away, it creates “pockets” that fill up with even more plaque and bacteria, speeding the process of the infection. A fast treatment plan is crucial when it comes to keeping your teeth healthy! Believe it or not, gum disease can even affect those who practice good oral care. Using improper brushing techniques, old toothbrushes, forgotten dental visits, or forgetting to floss can contribute to the development of the disease. If you feel like you could be suffering gum disease, don’t hesitate to make an appointment today! Dr. Scharf! is a highly experienced, highly trained local Periodontist specializing in gum disease treatments, Laser Periodontal Therapy (LANAP), and dental implants in Long Island. When meeting with Dr.Scharf, our periodontal specialist, you can expect a thorough examination of gums to determine the overall health level. He will determine if a periodontal infection is present, and will determine the severity as well as a treatment plan. Many mild cases of gum disease can be fought with simple cleaning procedures if treated right away, while other cases may require more severe treatment plans. Dr. Scharf is one of the best periodontists in Long Island when performing the LANAP procedure, a highly effective treatment for gum disease. The Laser Assisted New Attachment Procedure (LANAP) is a revolutionary treatment, one that replaced the original “surgical” method. A small periodontal probe is inserted into the gum “pocket” while small lasers move around the tooth. These lasers destroy 99% of diseased tissue and bacteria below (and above!) the gum surface. Next, Dr. Scharf will remove any excess plaque, tartar, or dental buildup. The probe will be re-inserted into your dental pocket, and will form a protective blood clot that will protect your gum when healing. Because of it’s less-invasive, non-surgical nature, patients are usually able to fully heal in a 48 hour time period. The LANAP procedure is so great because it preserves more of your healthy gum tissue than the original method would have. Who doesn’t love a fast recovery time and more healthy gum tissue? The entire procedure can be completed in only a two hour appointment, and any pain felt afterwards can be easily managed with over-the-counter medications. However, it is strongly recommended that patients come in for a follow-up appointment every three months following their LANAP procedure. This is to ensure that no new infection is developing! If you’re dealing with gum recession or tooth sensitivity, Dr. Scharf may decided that a Pinhole Surgery Technique is more appropriate for you. Pinhole Surgery is used to solve problems associated with gum recession. Instead of cutting tissue from other areas of the mouth, and using it to “patch” up the gums, the Pinhole surgery technique stretches existing gums over your teeth to cover the sensitive areas. There are no incisions of any kind, allowing for faster recovery and immediate results. Instead of waiting for your gums to heal, the Pinhole Surgery delivers instant protection against infections like periodontal disease. Surgery can be completed in under an hour, and patients may resume regular eating and drinking following the procedure. If you suspect that you could be suffering from gum disease, please do not hesitate to call our office and make an appointment today! 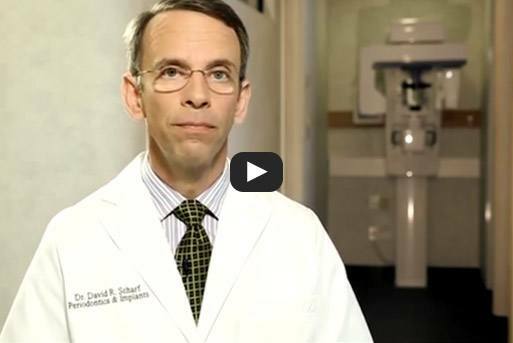 Dr. Scharf is a specialized periodontist who comes highly qualified. He’s knowledgeable in state-of-the-art, less invasive dental procedures. Dr. Scharf will have you feeling great about your smile again!